Other Notes: Malts – Maris Otter, Two Row Brewers, Smoked Malt. 2-Rpw Chocolate Malt, CaraMunic III, Carafa III. Hops – Nugget, Mt. Hood, Willamette. 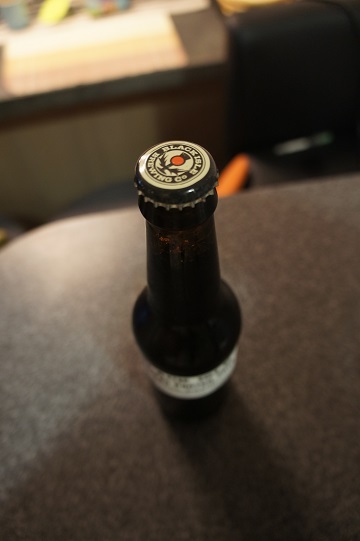 Brewer Description: (from website) This nostalgic porter evokes memories of chocolate and coffee around a campfire. The cherry wood smoked malt used in this beer gives it a heavy smokiness that blends smoothly into the chocolate malty body. 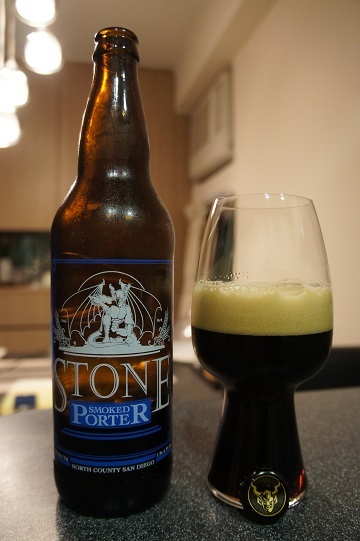 With a silky finish this porter is ideal for sipping on a cold winter’s eve. Intro: A 22oz bomber from release batch #33 with a brew date of 2nd March 2015 and a packaged date of 16th March 2015 and poured into a Spiegelau stout glass. Appearance: It poured a deep dark brown with amber hues and a nice one fingered tan head that dissipated to a thin creamy layer and leaves spotty lacing. Aroma: The smoke aromas were light but instead mainly chocolate, some dark fruits and hints of coffee. Taste: Felt more smoke in the taste than the aromas, but still on the light side. On top of the smoke though, there is chocolate with hints of toffee, plum and raisin as well as some nice light bitterness. Mouthfeel: Smooth, creamy, medium bodied and light to medium carbonation. 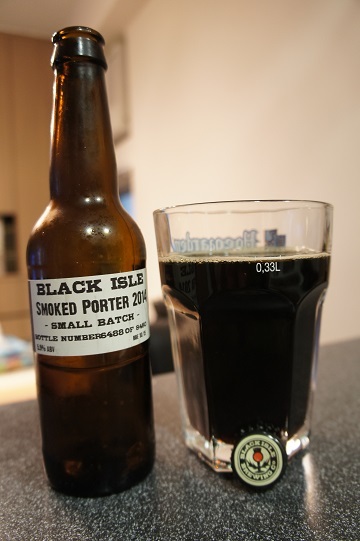 Overall: I enjoyed this but the smokiness in both the aroma and taste was less than I expected. Despite this, I would probably still buy this again. Other Notes: 53 IBUs. Hops – Magnum and Mt. Hood. Brewer Description: (from bottle) So you want something dark do you? We’ve got you pegged. You are the type who saddles up to the bar, scanning the tap handles for something beyond the pale, fizzy pabulum whose all too familiar neon advertisements garishly adorn the windows of taverns and bottle shops across the land. 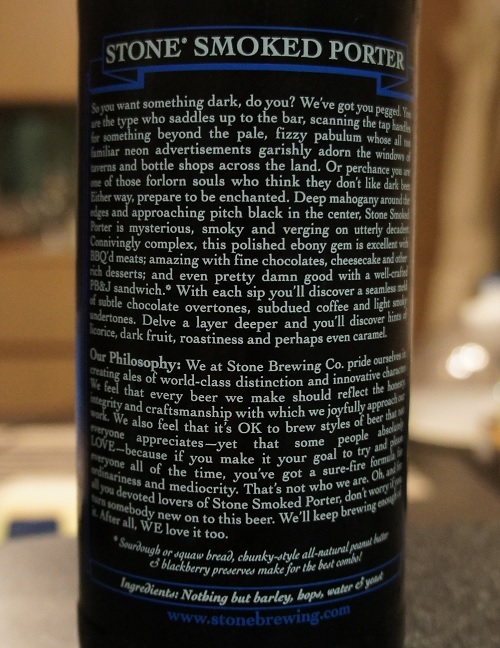 Or perchance you are one of those forlorn souls who think they don’t like dark beer. Either way, prepare to be enchanted. 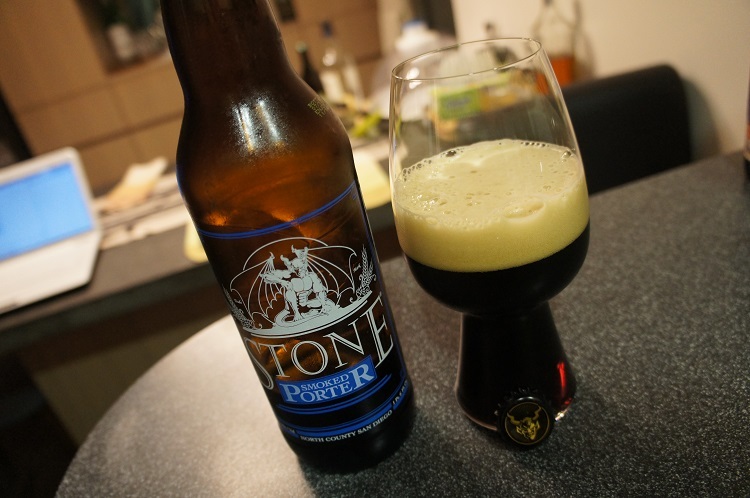 Deep mahogany around the edges and approaching pitch black in the center, Stone Smoked Porter is mysterious, smoky and verging on utterly decadent. Connivingly complex, this polished ebony gem is excellent with BBQ’d meats; amazing with fine chocolates, cheesecake and other rich desserts; and even pretty damn good with a well-crafted PB&J sandwich. With each sip you’ll discover a seamless meld of subtle chocolate overtones, subdued coffee and light smoky licorice, dark fruit, roastiness and perhaps even caramel. Our Philosophy: We at Stone Brewing Co. pride ourselves in creating ales of world-class distinction and innovative character. We feel that every beer we make should reflect the honesty, integrity and craftsmanship with which we joyfully approach our work. We also feel that it’s OK to brew styles of beer that not everyone appreciates – yet that some people absolutely LOVE – because if you make it your goal to try and please everyone all of the time, you’ve got a sure-fire formula for ordinariness and mediocrity. That’s not who we are. 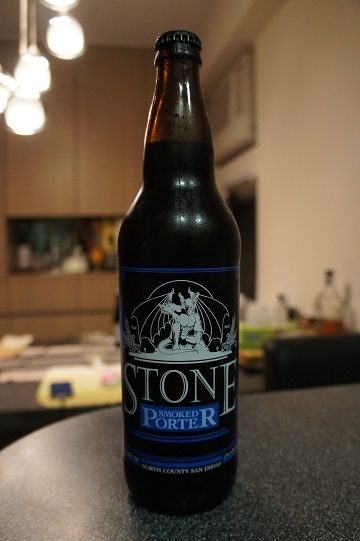 Oh, and for all you devoted lovers of Stone Smoked Porter, don’t worry if you turn somebody new on to this beer. We’ll keep brewing enough of it. After all, WE love it too. Intro: A 22 fl oz bomber with a bottled on date of 17th July 2015 and an enjoy by date of 14th November 2015. Poured into a Spiegelau stout glass. Appearance: Poured a dark dark brown colour with a light amber hue and a nice two fingered tan head that dissipates slowly leaving stringy lacing. Aroma: Smokey, roasted malts with some light chocolate and cream. Taste: Roasted malts and bittersweet chocolate. 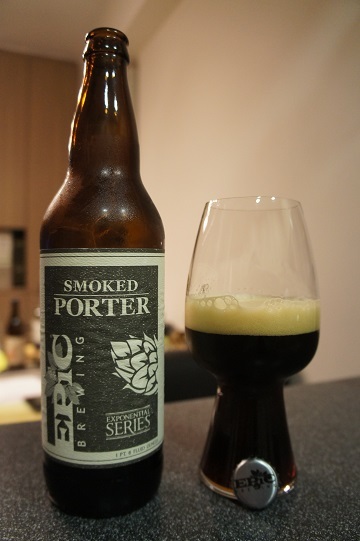 There is also some light smoke which is ashy and hints of licorice and milk coffee. Mouthfeel: Creamy, smooth, medium bodied with light to medium carbonation. 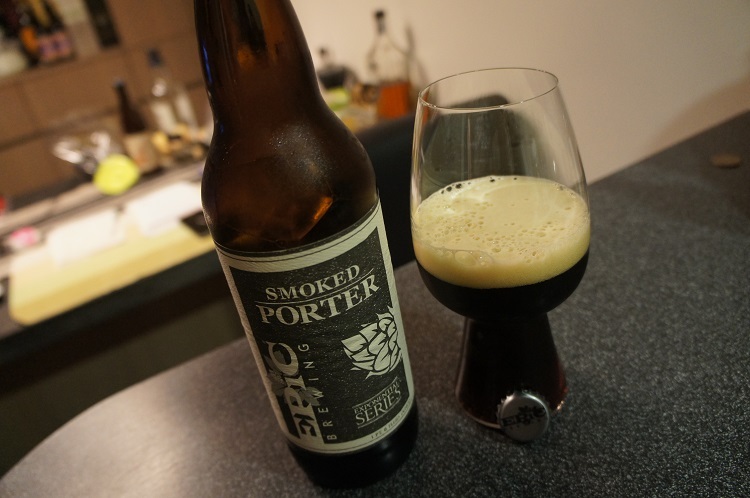 Overall: The smoke taste was a bit ashy for me, but otherwise this was a nice smoked porter. 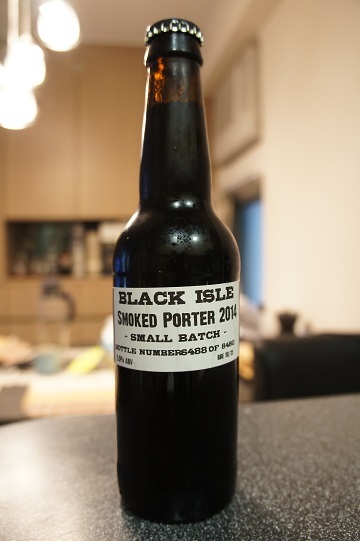 Brewery: Black Isle Brewing Co.
Other Notes: aka Black Isle Organic Smoked Oktobeer. This is a blend of German roasted malts and our local smoked barley which might even put a smile on a disgruntled German Chancellor’s face. Balance is what this little beauty is about, something that takes great skill from the brew team and boy they have achieved it here in bucket loads, or we should say conditioning tank loads, one to be specific.. and even then not a full one. Grab it while you can, it won’t be around forever. Intro: A 330ml bottle from the 2014 small batch, bottle number 6488 of 8480 with a best before end date of October 2015. It was poured into a pint glass. Appearance: It poured a dark brown with a thinnish cream tanned head that did not stick around too long. 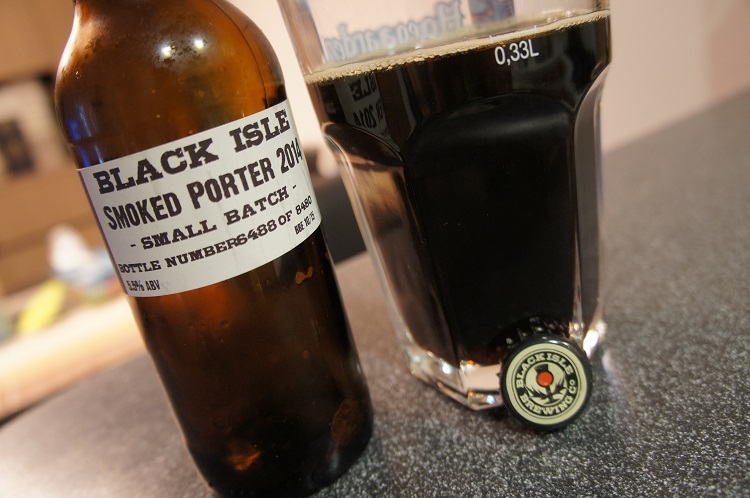 Aroma: Aromas of roasted malts with a bit of chocolate, licorice and slight peat smoke. Taste: Starts slightly sweet caramel and chocolate maybe even some toffee, but finish is definitely smoky, bitter and lingering ash. 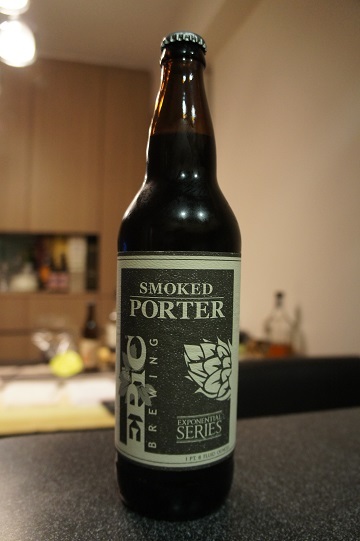 Overall: I’ve had quite a few smoked beers before and although this was not at the top, it was still pretty good. I would buy this again.